Written By: Tom Wuckovich, former senior editor of AAA Going Places magazine and now freelances from his base in Tampa. 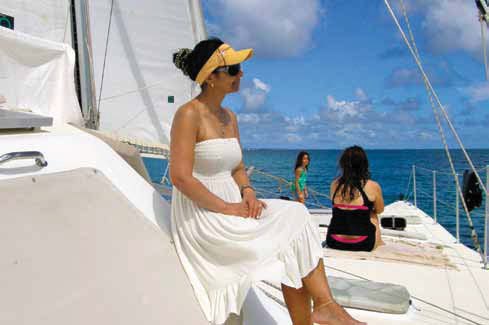 Sailing vacations have been an integral part of my life for more than 30 years. I have been fortunate to share this experience with friends and family on almost every occasion. Most developed the same passion for charters as I did, but it is always rewarding to see someone embrace sailing as enthusiastically as my 10-year-old granddaughter Gabrielle, when she accompanied me for the first. 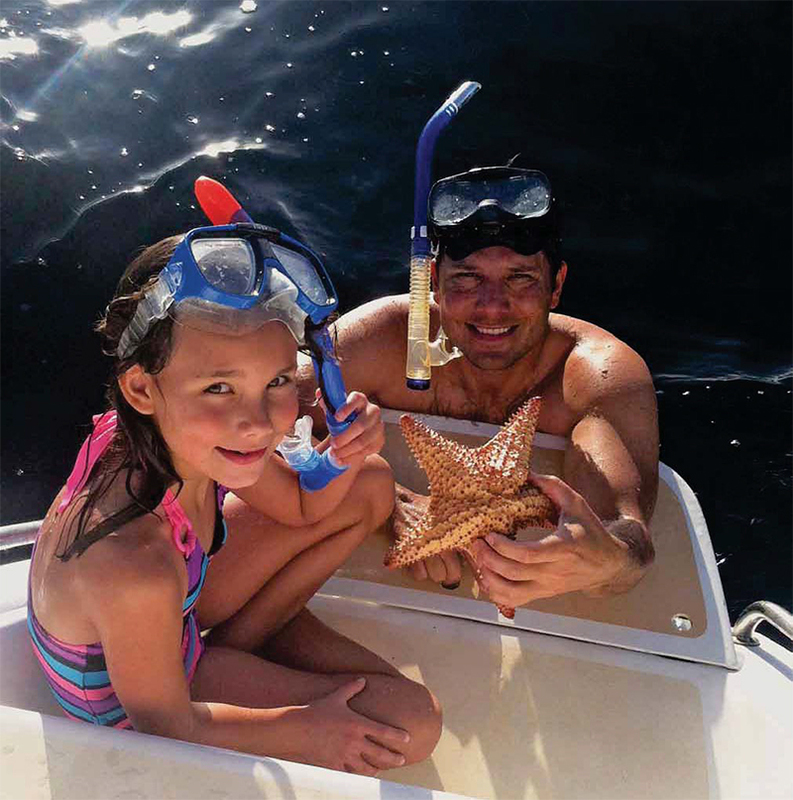 She could scarcely contain her enthusiasm when I first proposed the idea to my daughter Robin and her husband Sean, who sailed with me on two charters—but more than a dozen years had passed since our last outing together. The excitement of knowing they would come with me again, along with my wife Dene, also a first-time cruiser, made me all the more eager to get this trip underway. Prior to the sail, which would be in the Leeward Islands of St. Maarten, St. Barth’s, St. Eustatius (Statia) and St. Kitts, I would tease Gabrielle with tall tales of pirates and treasure, unusual sea creatures and hidden island coves ripe for exploration. The stories kept her spellbound and our day of departure seemed much too far away to suit her. 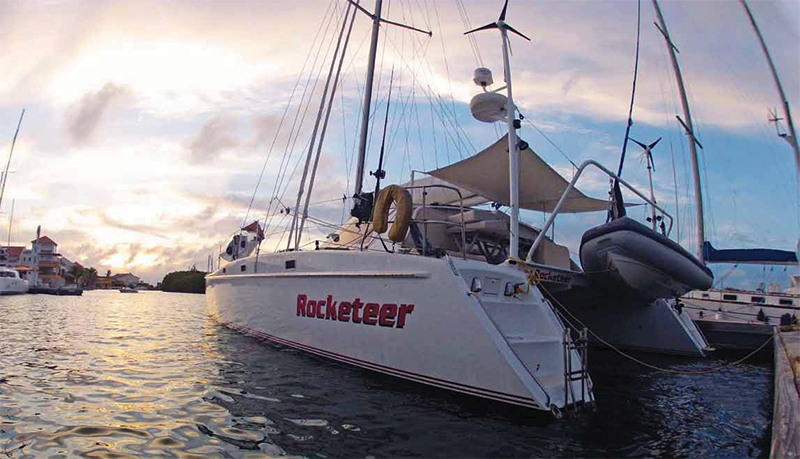 It was a warm day in late October when our flight landed in Sint Maarten where we were greeted by Captain Glenn Howell and Grassa Ramos, the crew and owners of the 55ft catamaran aptly named Rocketeer. I had found this boat through Nicholson Yacht Charters. After brief introductions, they informed us we could dinghy to the boat from a dock across the street from the airport parking lot. Gabrielle was simply ecstatic. What an incredible beginning to this new adventure. The dinghy skimmed across the jade-colored waters of the bay for only a few minutes before we caught sight of the gleaming white cat that would be our home for seven days. Inside and out, it was roomier than a monohull, with a living room-sized salon and four comfortable cabins that were air-conditioned if cruisers were so inclined. Also, Rocketeer’s speed and agility gave us the courage to sail downwind as far as St. Kitts, then return to St. Maarten — certainly an ambitious goal given our time constraints. After our initial briefing and discussion about itinerary, we hauled anchor and left Simpson Bay on the Dutch side for an evening sail to Marigot, the capital of French St. Martin. In St. Maarten/St. Martin yachtsmen can take pleasure in two cultures — Dutch and French. Marigot has a more defined European flavor, and most shops and stores sell French perfume, clothing and fine art, while local vendors offer handmade carvings, fresh fruit and Caribbean art. On the Dutch side, the myriad stores on Front Street feature merchants famous for their gold jewelry, watches and electronics. This island welcomes yachtsmen and also provides enough activities, quaint bights and sights to fill a week’s charter without ever leaving its cruising grounds. But we had more ambitious plans, yearning to feel the salt spray and see what challenges the sea could offer. Before that, however, Gabrielle was intent on searching the island for memories as well as treasure. We explored Ft. Louis above Marigot and then stopped for swimming and snorkeling at Il Pinel and Oyster Pond, before heading south for St. Barth’s, a favorite haunt of the rich and famous. I explained to Gabrielle the rumor that Jimmy Buffet wrote the song ‘Cheeseburger in Paradise’ after eating one at Le Select just off the waterfront. Her response? “Who is Jimmy Buffett?” I needed to rethink what information I wanted to emphasize. Gabrielle appreciated all the history of the islands and certainly what was happening above and below the water. I realized what I needed to focus on. 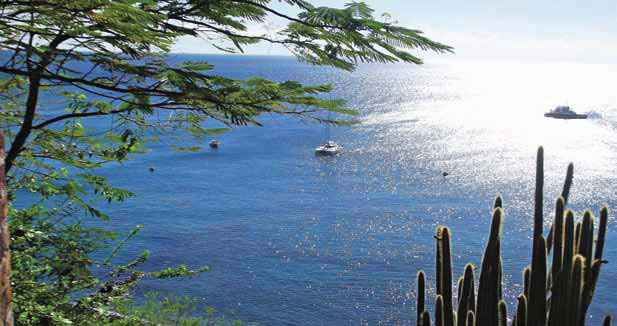 After snorkeling north of Gustavia, we began the long sail to Statia. Sean became a valued deck hand and relished the chance to crew the boat. We reached the island in just under seven hours, tacking several times along the way. 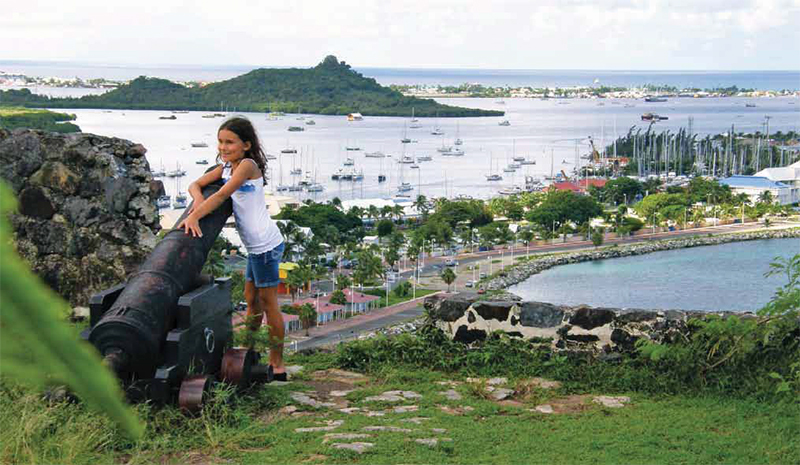 Statia is notable for its nature and marine life and the capital of Oranjestad is worth a look-see. Sean, Robin, Gabrielle and Glenn hiked up to the inactive volcano for an in-depth look at the flora and fauna. The rest of us were content to take photos from the fort and swim in the harbor to cool off. After everyone returned and an evening of one of Grassa’s delicious Brazilian meals, we lifted anchor at first light and made for St. Kitts. We were already into our fourth day and after St. Kitts, we would do nothing but sail back to St. Maarten in time for our return flight to the U.S. But on the way to St. Kitts, as if on cue, King Neptune sent waves and waves of dolphins to swim and cavort alongside the cat. Gabrielle was beside herself and we all reveled in this pleasant surprise, which lasted the better part of an hour. It was just one of many memorable happenings on this journey.